Unit Size – Your home’s square footage is an important part of determining the correct air conditioning size for your home. The wrong size unit may not properly cool your home or may cycle on and off frequently, which will waste energy and increase your utility bill. SEER Rating – All air conditioning units are assigned an efficiency rating by the U.S. Department of Energy (DOE). The higher the SEER rating, the more efficient your unit will be. High-Efficiency Options – Higher rated and dual speed units will cost a bit more upfront but will save energy and money over time. Schedule a free consultation today with one of our experts to find the right air conditioning system for your home and budget! We serve Sanford & Tampa, Florida. All of our HVAC technicians are experts in repair and installation. You get to choose from the top brand names in AC equipment. We offer special financing with approved credit, including convenient monthly payments. We offer affordable service and maintenance programs. We also offer the industry’s best extended warranties. We provide a $500 best price guarantee. Reduce your electric bill with a higher SEER unit. Keep your air 99.97% clean with HEPA filtration. You may qualify for tax credits, energy company rebates, and manufacturer rebates when purchasing a new unit. We’ve been pleasing customers like you since 1983. Our customers say it best…Want more information? 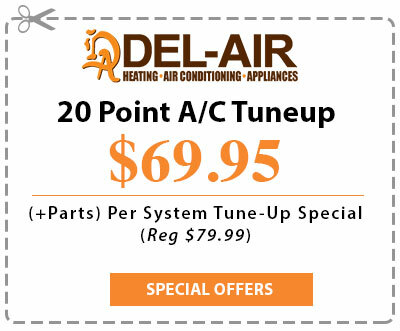 Find out more about purchasing from Del-Air Heating and Air Conditioning!